One of the most appealing benefits of applying statistical analysis to football, is the hope that it can narrow down the scope of players that should be scouted for potential transfers. With the January transfer window looming, I decided it was an opportune time to mine some of the data that I’ve collected to identify the best transfer targets in the Scottish Premiership. Given that my stats are shot based, I have narrowed the focus of this study to look for players whose strengths are goal scoring & then in the next part of this series, for the best playmakers in the league. Ultimately, the aim is to model an approach that would include many more layers of analysis that you’ll see here. The idea is that the statistical analysis here would function as the beginning of a process of player recruitment (if this was a real life situation). Let’s start by looking for goal scorers forwards. It seems like any exploration of top rated strikers would focus on shot volume & shot quality. For shot volume, I wanted to eliminate some of the “noise” that can come with only including total shots. 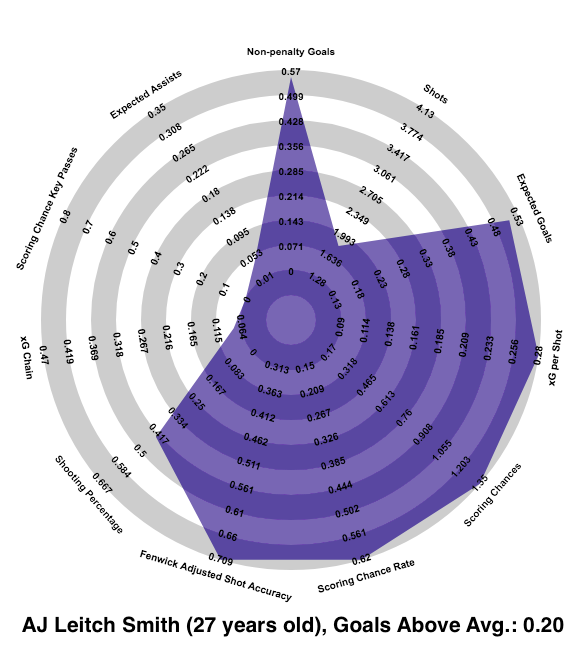 For example, if you look at Alfredo Morelos, he has a shot total of 28 – which averages out to 2.72 shots per 90 minutes. That shot rate is pretty good (the top 20% of Premiership forwards average at least 2.75 shots per 90 – so he’s right there). But that shot total can also be misleading. To highlight this, let’s look at some shooting statistics that can begin telling us more of the story about how Morelos has performed this season. That shot accuracy of 39% isn’t very good (Scottish Premiership forwards in this study have a combined shot accuracy rate of 44%). But, his conversion rate of 21% is significantly better than his peers (14% is the average rate for the rest of the forwards in the league). But…the fact is that Morelos has actually been much better then those numbers suggest. That’s because we need to strip away some of the ‘noise’ that comes with just looking at total shots. When evaluating the statistical results to identify goal scoring abilities, it seems foolish to include shots that are blocked as part of that analysis. If all shots aren’t created equally, then neither are shot blocks. Some blocks occur because of stellar defensive play, some happen because of poor shot selection, & some are even debatable events based on who the official Opta scorer is assigned to a match. So, moving forward we will only be using Fenwick Adjusted Shot stats (basically a fancy way of saying we’ll only be looking at unblocked shots). He has taken 19 unblocked shots this season, which drops his unblocked shots per 90 rate to 1.85 (remember he averages 2.72 total shots per 90)…that’s the example of the ‘noise’ that I mentioned. 39% of his all his shots have been on target, but 58% of his unblocked shots have been on goal. That’s a significant difference & aligns more with what the ‘eye-test’ has shown us all season long. His Conversion Rate has been 21% (rate of shots that are goals), however his Fenwick Adjusted Conversion Rate is 32%. If we move forward with this idea as a given, it will be more & more important to consider a player’s Expected Conversion Rate as a key component of their analysis. Standard Conversion Rates divide a player’s goal totals by how many shots they have taken. Expected Conversion Rates (xCR), introduced here on this site, takes a player’s Expected Goals & divides it by their shot totals. Again, we only really want to look at shots that actually made its way towards goal, so xCR only includes unblocked shots. Remember, that Morelos’ actual conversion rate is 32%. How does that compare to his Expected Conversion Rate? He has a total of 5.09 xG this season, but that total is for all of his shots (noise) this season. If you adjust that xG total to take away blocked shots its actually 3.64. So his Expected Conversion Rate calculates to 19% (3.64/19). That’s much lower then his Fenwick Adjusted Conversion Rate of 32%. It’s interesting to note that both rates have been trending downwards in the past month. In early October, his xCR was 23% & his FenAdj Conversion Rate was 46%. He was scoring at twice a rate then his expected rates suggested he should be. He hasn’t scored since then & his scoring rates have normalized. This is an isolated example of why we’ll be using xCR to identify goal scoring targets. We’re going to couple that rate (measuring the quality of chances a player gets) with his unblocked shots rates per 90 minutes (shot volume). Below is that data for each forward who has played at least 200 minutes (a liberal number but sometimes small sample sizes flag players to look closer at – albeit with the skeptical lens that comes with small sample sizes). Moussa Dembele has only played 325 minutes this season but he is back to producing at rates that are beyond elite for the Scottish Premiership. His FenAdj Conversion Rate is currently 33%, while his xCR is 24%. His goal scoring rate will taper off a bit, but he currently is averaging 1.11 goals per 90. If you substituted his xCR with his actual conversion rate on unblocked shots he’d still be averaging 0.80 goals per 90. So yeah, it’s a matter of time before the transfer offers are too good for Celtic to turn down. Hamilton’s Antonio Rojano has played even less minutes but is one to watch for. Let’s see what happens to his stats in a month or two. Right now, I’m excluding the likes of Lee Erwin & Martin Boyle as targets because the volume isn’t there & neither is the quality. The group in the High Volume but shot selection issues, have some intriguing names (I see you Louis Moult) & I’ll come back to him later in the post. But first….how the hell is Simon Murray gravitating towards been an outlier in the Don’t look now, but he may become a reliable goal scorer category? It’s time to polish off some stats radars to get the full picture of how Murray has performed this season. (Note: margins on these are based on forwards who have played at least 400 minutes). Murray isn’t a true outlier yet – but the indicators are that he could definitely improve moving forward. His ability to get on the end of Scoring Chances at a high rate drives up his xG despite a relatively below average total shot number. He’s getting his unblocked shots on target but his low Shooting Percentage (goals/shots on target) would be an entry point for further analysis. What’s leading to those shots being saved? Is it something he’s doing wrong that may be improved by coaching? Or is it a stretch of bad luck that may even out as he continues to get quality shots? At 25 years old, Murray still has 3-4 seasons left of being a player in the peak years of his career & only Dembele is getting more unblocked shots per 90 minutes while generating an Expected Conversion Rate of 25% or higher. Given Hibs’ recent reluctance to sell assets to Rangers, he’s not a realistic target for the club. If I was an English Championship or (especially a) League One club, I’d be heavily scouting the forward, who is just a few seasons removed from being Arbroath’s top striker. AJ Leitch-Smith is an intriguing player. He’s on loan with Dundee from Shrewsbury Town (English League One) until January, while his contract with Shrewsbury is due to expire this summer. His Expected Conversion Rate is quite high (28%), but his volume of unblocked shots is less impressive (1.46). Ummm….there’s a lot to like here. 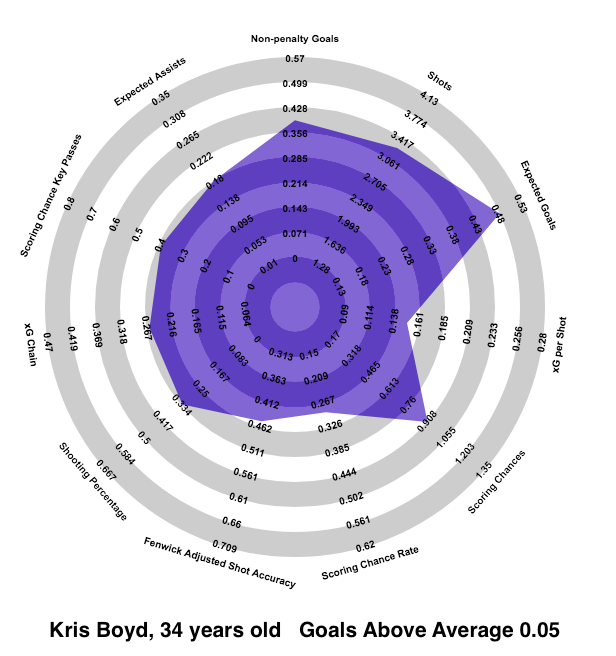 He’s scoring at a very high rate (his Goals Above Average [GAA] is on par with Liam Boyce from last season) & even though he’s only played in just under 500 minutes – his Expected Goals per 90 is pretty aligned with his actual output. If he continues to get Scoring Chances at that rate, his Shot Accuracy & even his Shooting Percentage may not take too much of a hit with more minutes. His current Fenwick Adjusted Conversion Rate is 38%, while his Expected Conversion Rate is 28%. If he was scoring at the rate of his xCR, his goals per 90 would be 0.46 (his actual rate is 0.55). Leitch-Smith has struggled to score regularly in England (his GAA last season was -0.15 & 0.11 the season before). Maybe an average-to-below average striker in England’s League One, could become an above average goal scorer in the Scottish Premiership? Is it a player Rangers should target? That’s a tricky one. But, if the team cashes in on Alfredo Morelos this summer, along with this likely being Kenny Miller’s last season, & the fact that Eduardo Herrera’s future with the club is tenuous….Rangers need to start scouting forwards & here’s one who is thriving at this level…so he’s worth a very close look? That brings us to the forward that the vast majority of Rangers support want the club to sign, 25-year old Louis Moult. First, let’s revisit the graph from above that looks at shot volume & shot quality. 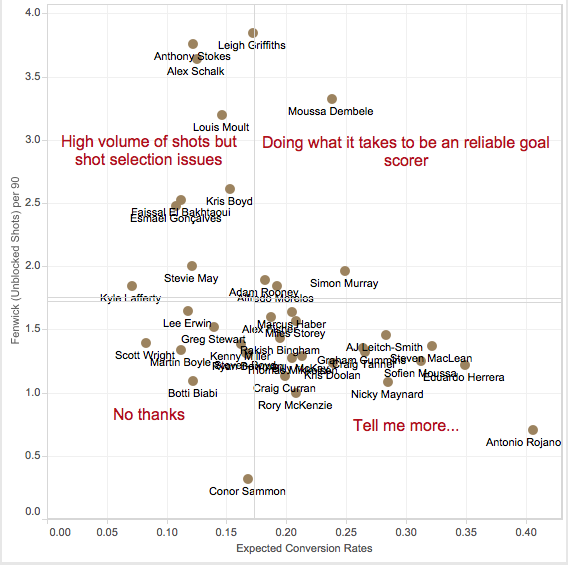 The shot volume is clearly there, with only Leigh Griffiths, Anthony Stokes, Alex Schalk (? ), & Moussa Dembele averaging more unblocked shots per 90 minutes. However, the shot quality is surprisingly uninspiring. 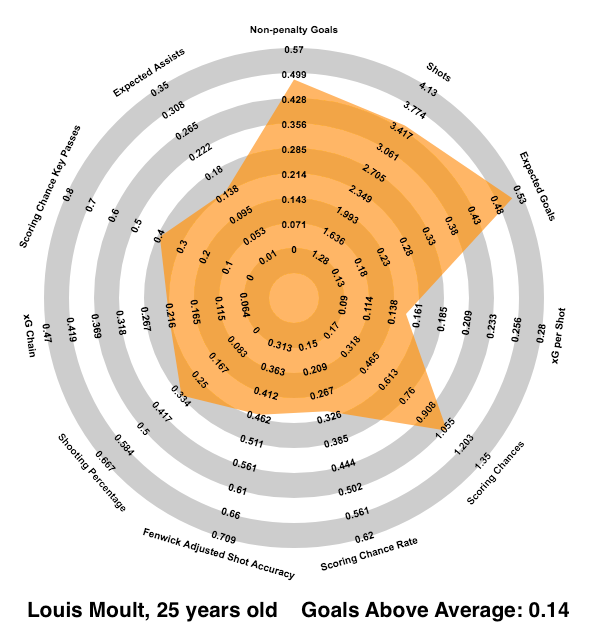 Moult has been good this season, but my concern is that the recency bias of his stellar performance against Rangers in the League Cup may blind decision makers to certain realities about the striker. Yes, he’s getting a high volume of shots & that has transferred to a good, not great goal output. His Goals Above Average of 0.14 is on par with Kris Doolan last season. Kris Doolan. A decent striker but not necessarily a game changer. It’s some of his underlying statistics that leave me, quite frankly, pretty meh. While his Expected Goals per 90 is among the best in the league, it’s largely due to the shot volume he creates. However, you can see that only 31% of his shots are Scoring Chances – which is pretty surprising considering Motherwell is among the better teams in the league at creating high quality shots. In fact, the team’s Scoring Chance rate (35%) is actually higher than Moult’s. For context, 31% of Rangers shots are Scoring Chances, while 43% of Alfredo Morelos’ shots are. That’s what you’d expect – teams tend to rely on their strikers to get the best chances in a match & Moult, quite frankly, is not doing that. This shot quality issue explains why Moult’s finishing rates are also not that impressive. Moult gets 46% of his shots on target & scored on 33% of those shots on goal. That rate is actually dragged down by poor finishing on high percentage shots. Moult has had ten unblocked Scoring Chances this season (kicked shots from the heart of the box & headers/kicked shots from the six-yard box) & only 40% have been on target (Morelos’ shot accuracy on Scoring Chacnes is 63%). 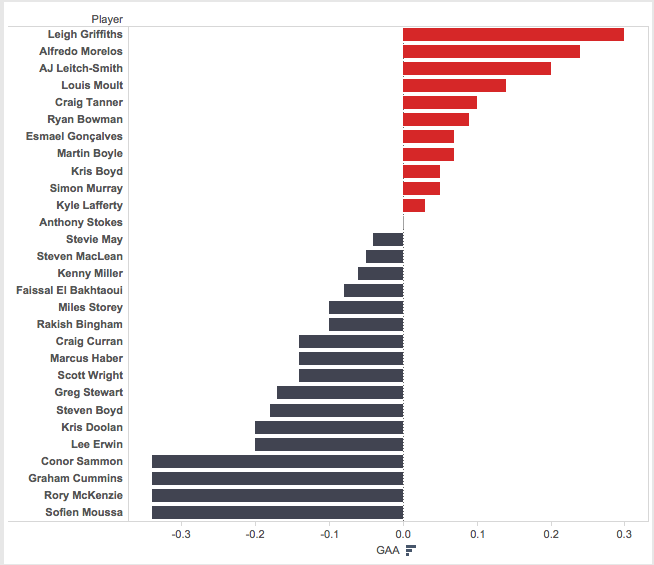 That means Moult has scored on 20% of his unblocked Scoring Chances, while the current Rangers striker has a 38% Fenwick Adjusted Conversion Rate (nearly double the success). The point is, Moult is not an absolute upgrade like many think he may be. In fact, his current production isn’t that far off from a certain TV pundit who trots out to lace up his boots on the weekend. That’s right. A 34-year old Kris Boyd currently is producing at roughly the same level as the current talk of the town, Louis Moult. From Expected Goals per 90 to Scoring Chances per 90 to Shooting Percentage– there is little difference between the two. Obviously, the biggest difference is age. But, the concern is that if Rangers invest heavily in Louis Moult – the return may not be quite what they, & the supporters, expect. The bottom line is that the pickings for goal scoring forwards from the Scottish Premiership is pretty bleak. Below you’ll see which forwards, who have played at least 400 minutes, are scoring at an above average level. Each player’s goals per 90 is compared to the average rate from the past four seasons of play from Scottish Premiership forwards. There are currently eleven forwards scoring at an above average rate. Big name forwards like Anthony Stokes, Stevie May, Kenny Miller, & Kris Doolan have not produced at a level that would match the average rate from the past four seasons. Some of the names in the positive end, based on their shot quantity & shot quality, are not necessarily creating a confidence that their current scoring rates are sustainable (Ryan Bowman, Esmael Gonçalves, Martin Boyle & Kyle Lafferty). So you can basically narrow the top half of that graph down to 4-5 names of forwards who should keep scoring at that rate. That’s not much & it makes me want to do more analysis of a forward like AJ Leitch-Smith because he’s looking more & more enticing as a sneaky transfer. 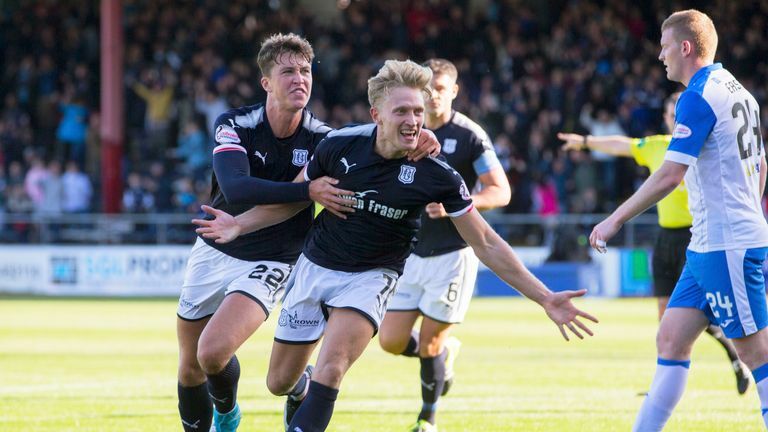 In part two we’ll see if the playmaking talent is any better in the Scottish Premiership & in part three we’ll see if any of the midfielders are providing scoring that is sustainable. Quite interesting to see ur take on moult, quite similar to my own. I think we should be looking for a striker from down south or abroad, I think there are better options. Interesting piece to read, aj leitch smiths stats r surprisingly high!